Carpets can add an elegant finish to your living and working spaces. However, carpets require regular maintenance to keep them in excellent condition. Restore the beauty and functionality of your carpets with the help of the experts at Carpet Care Craftsman. Our emphasis on quality services and unmatched workmanship has made us Colorado Springs’s carpet repair company of choice. Carpets in areas that are exposed to heavy foot traffic can suffer from cuts, scratches, and tears. Over time, carpets lose their aesthetic appeal, vibrancy, and usefulness. Dirt can settle so deep into the fibers of the carpets that even thorough cleaning may not be enough to restore them. Aside from looking unattractive, damaged carpets can pose various risks if problems are not properly addressed. Browse through some of the reasons why it is important to repair carpeting problems immediately. Carpet damage can potentially be a tripping hazard. Torn carpets can increase the risk of trips and falls. It might seem like a minor problem, but unrepaired rips, holes, or tears on the carpets make people lose their footing, which can result in serious slipping accidents. Damaged carpets can negatively affect your property’s indoor air quality. Carpets that are not properly maintained have a negative effect on the indoor air quality of your home or office. Aside from being an eyesore, heavily soiled or water-damaged carpets can be breeding grounds for bacteria and mold. Exposure to these allergens can cause skin irritation and respiratory problems. Damaged carpets decrease your home’s value. Carpets suffering from wear and tear are not just eyesores. Holes, burns, spills, and stains in your carpets can decrease the value of your residential or commercial property. If you are a tenant, your proprietor might charge extra for excessively stained or worn carpets. Before you shell out your hard-earned money on a carpet repair company, make sure you are hiring technicians that are certified by a recognized organization. Have peace of mind knowing that your carpets are in good hands when you hire a company that is certified in the field. Choose a company that has extensive experience in the carpet repair industry. When you hire experienced technicians, you work with a professional crew that can deal with various problems requiring different types of carpet repairs. Rely on a company that consists of professionals who are highly trained in providing carpet repairs. Hire a contractor that is up to date with trends and meets current standards set by the industry. Carpets harbor a disgusting amount of pollutants, allergens, and dirt. A dependable carpet repair company not just fixes carpet issues but also makes your property free from health hazards by eliminating contaminants from your carpets. Reputable carpet repair companies who are equipped with the necessary skills and experience will have no problem backing their work with a service guarantee. Hire a carpet repair company that is confident in the quality of their services. When it comes to carpet repairs, no other company does it better than Carpet Care Craftsman. We take pride in providing superior solutions to any of your carpet problems. We have in-depth knowledge, extensive experience, and advanced tools to repair carpet products of various types and styles. Let our experts restore your prized floor covering to like-new condition. Do not let a minor carpet problem turn into a major one. Have your carpets repaired by qualified carpet experts. Check out some of the cost-efficient repair services that can help keep your carpet in the best condition possible. Is your carpet starting to bubble, buckle, or ripple? No problem. With carpet stretching services, you can make your carpet look smooth and new again. Request a service today to ensure that your flooring is free from any tripping hazard. If pet stains, cigarette burns, or scratches have ruined a portion of your carpet, worry no more. You can restore its beauty by having that damaged area patched. Carpet patching services help bring your frayed, torn, or burned carpet back to life. Plumbing leaks and floodwater can damage your carpet when water soaks into the carpet pad and is left wet for days. In addition, pets can dig or chew holes in your carpet, causing damage to the padding underneath. Extend the life of your prized carpet through carpet padding repair services done by qualified carpet repair technicians. Your carpets are a smart investment. They beautify and protect your flooring at the same time. That is why it is important to keep them in tip-top shape. Do not let a damaged carpet ruin your property or affect your health. Whenever you need carpet stretching, patching, and other types of carpet repairs, you know where to go to. Carpet Care Craftsman is here to serve all your carpet repair needs. Expect nothing but commendable services when you entrust your carpet repairs to us. 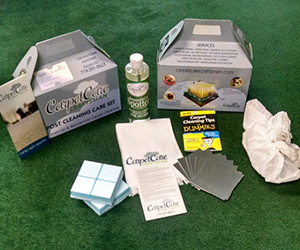 At Carpet Care Craftsman, we are dedicated to delivering outstanding solutions every time. We make sure that the services we offer are exactly what you need. Tell us how we can serve you best. Should you have any questions about the complete carpet repair services we offer, feel free to get in touch with us. We have friendly representatives who will be more than happy to attend to your inquiries as soon as possible. You can view carpet repair tips here. End your search for top-quality carpet repairs with Carpet Care Craftsman. Since we started, we have been providing a wide range of carpet repair solutions. We pride ourselves on being a trusted carpet care partner for various residential and commercial clients in the area. Contact us today to schedule an appointment. Click here to contact us.